Equate Human Resourcing sources good people for the telecommunications, wireless & geo-spatial industries (among others). But like many recruiters, they receive CVs in multiple formats: paper, Word documents, PDFs, emails and more. They wanted a website which reflected their aspirations & wanted a system to rationalise the intake of their CVs via the web, so it could be automated as much as possible. In addition, Equate wanted their prospects to answer specific questions that would help the company place these prospects into the appropriate slots. While Equate is a small company, it’s clear that what they needed was data integration—a common feature of enterprise-level software. Equate wanted all the data to be integrated into an Outlook database, which would be served from the company’s internal server. The data that the prospects entered would help the company place them into the appropriate categories. At first, Equate merely wanted a simple CV submission system via the web—they were planning on managing the data integration into Outlook by hand. In an interview session, we showed the folly of this approach: they receive as many as 5,000 CVs daily. We tried submitting a sample CV & asked them to time how long it took to integrate it manually into the Outlook database. It took 30 seconds. We calculated that it would take one member of staff to work exclusively on data entry every week to keep their system up to date. This showed Equate that they needed this process automated and ardes supplied them with a system which integrated 5,000 CVs within the space of a few minutes. Their staff were free to pursue more leads, which in turn helps Equate’s turnover. 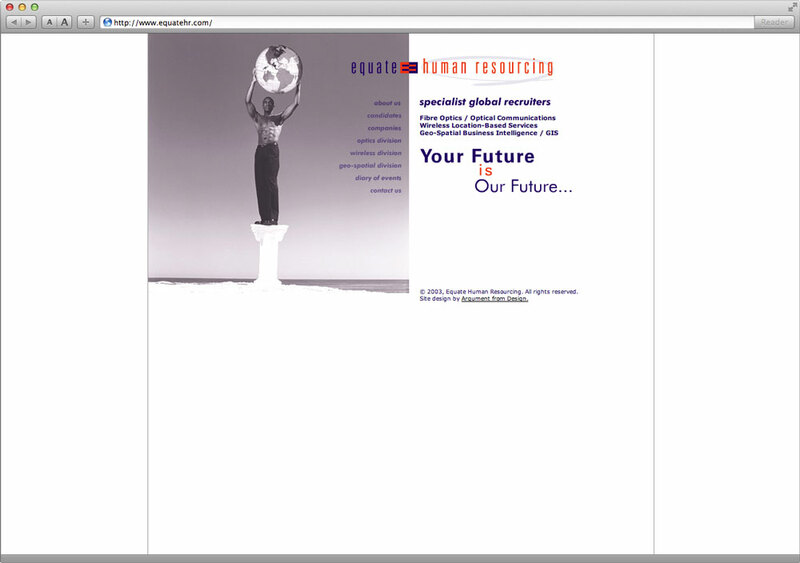 Three elements for the website were paramount: Equate’s logo, their corporate colours & a favoured photograph of a muscular man holding up a globe. Equate’s logo, which has a lavender circle around the words “Human Resourcing”, was ripe for judicious use of Flash: since the design’s purpose is to look like someone has circled the logo (as if circling a job in the newspaper), it made a lot of sense to animate this circling. The company’s corporate colours are used exclusively throughout the website & many elements of the photograph are replicated throughout as well, to suggest the globe-straddling position this company enjoys. One of the aims ardes always have in mind for any website we create is “Return-On-Investment” (ROI): how quickly what we make for you will cover the costs of development. The clearest ROI in Equate’s website is the automation of their CV submission process: because of ardes’s work, their company saves an individual’s salary every week. Now that’s what we call return on investment!